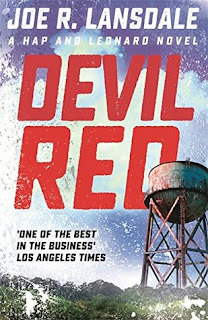 Hap Collins and Leonard Pine return in a red-hot, mayhem-fueled thriller to face a vampire cult, the Dixie Mafia, and the deadliest assassin they’ve ever encountered—Devil Red. When their friend Marvin asks Hap and Leonard to look into a cold-case double homicide, they’re more than happy to play private investigators: they like trouble, and they especially like getting paid to find it. It turns out that both of the victims were set to inherit serious money, and one of them ran with a vampire cult. The more closely Hap and Leonard look over the crime-scene photos, the more they see, including the image of a red devil’s head painted on a tree. A little research turns up a slew of murders with that same fiendish signature. And if that’s not enough, Leonard has taken to wearing a deerstalker cap ... Will this be the case that finally sends Hap over the edge? Lansdale has been called the bard of East Texas, and there is a poetic anarchy to his storytelling. Though it's an energetic poetry, sort of slam poet mixed with swamp noir, more than any languid verse from old British schooling. His distinctive storytelling style has seen Lansdale scoop up more than a dozen awards, including the prestigious Edgar Award for crime writing. Several of his tales have been adapted for film and television, including his quirky and riveting Hap and Leonard series. DEVIL RED is the eighth in that series, and is another short jab to the ribs of a book; slim but potent. The unlikely duo - Hap looks like a good ole boy but was once a conscientious objector who’s now pretty darned handy with his fists, Leonard is a black, conservative, gay Army veteran - are once again dropped into a whole lot of trouble, and it's a heck of a fun read to see how they respond. While some of the dust-ups and deadly scrapes will be familiar to long-time readers of the series, there's still a sense of freshness and evolution in this eighth instalment. Hap is struggling after being previously shot, and questioning himself and what he's capable of. His relationship with Brett is deepening, while his forever-pal Leonard is wondering if his own relationship is at an end (his boyfriend having been sent off for 'conversion therapy' by his family, trying to 'straighten' him out). This is a heck of a fun read. I tore through it in less than a day, and found myself continually grabbing for it whenever I had a moment during a full schedule. There's just something a little different about Lansdale's storytelling, a vibrancy and freshness and quirkiness that makes it oh-so-compelling. Hap and Leonard's escapades go to all sorts of dark and violent places, but there's humour and fun and light-heartedness too. The friendship between the unlikely pair feels wholly authentic, as does the way all the characters relate to each other. It's a largely blue-collar world, gritty and real. Lansdale keeps a grin on readers faces both with the adventure-filled story and little turns of phrases here and there. Hap is a fascinating narrator, and the dialogue sparks with everyday wit and vernacular. This is roll up your sleeves crime fiction. Dig in.